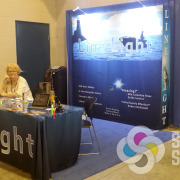 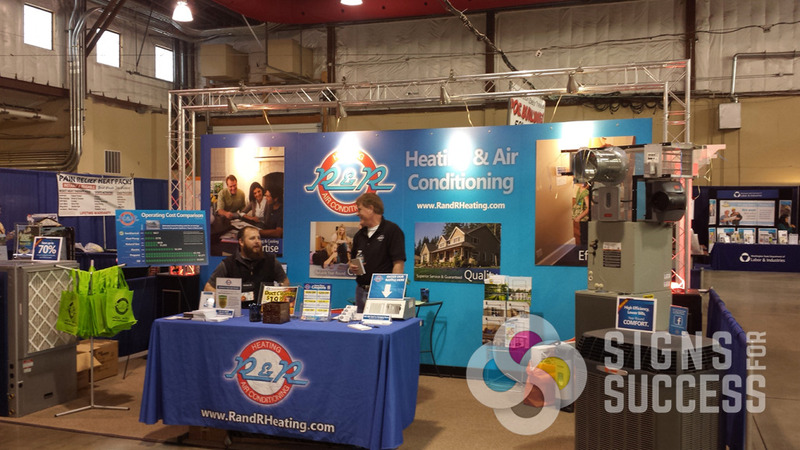 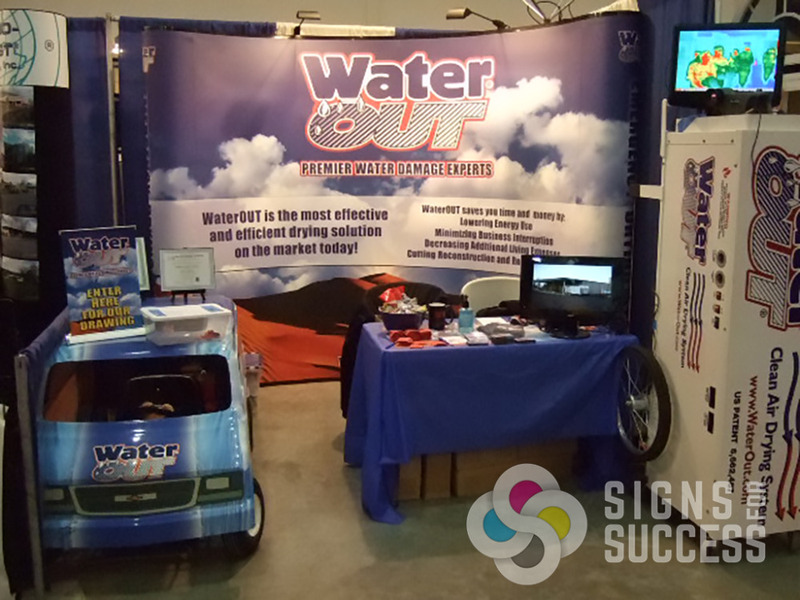 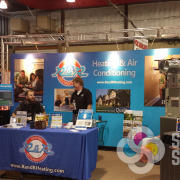 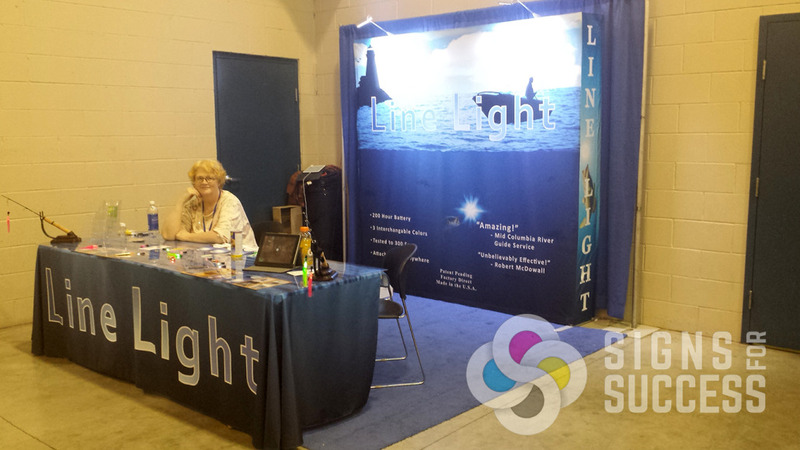 Trade Show Displays make great visuals at your next booth! 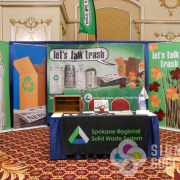 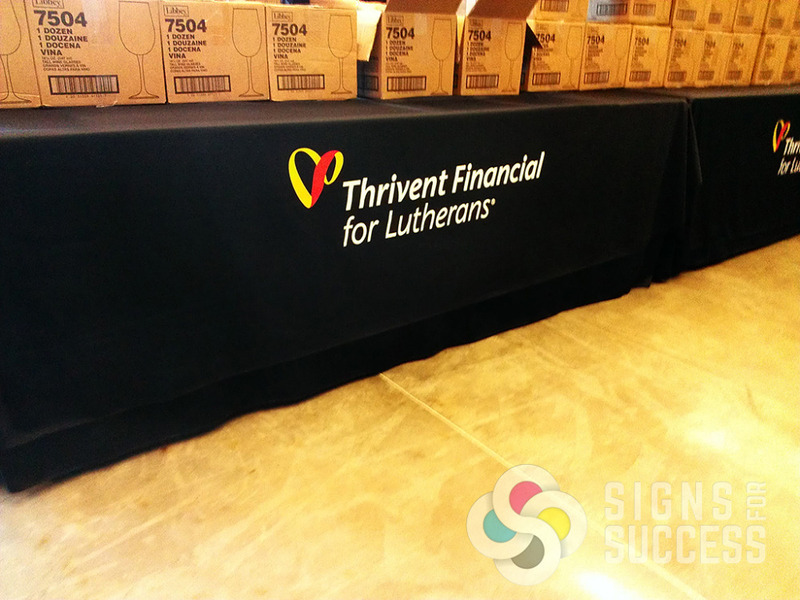 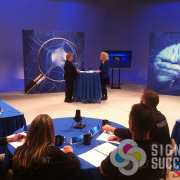 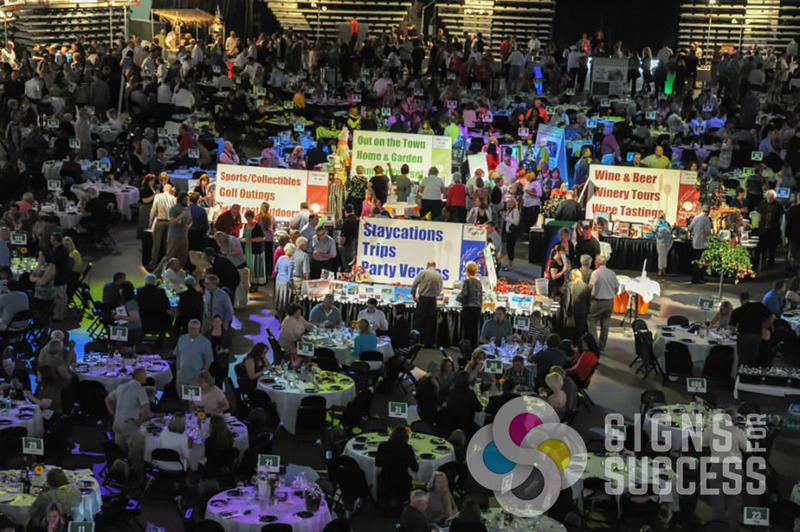 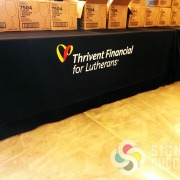 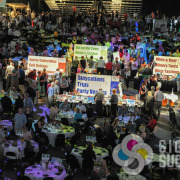 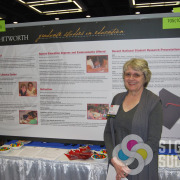 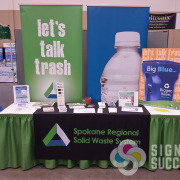 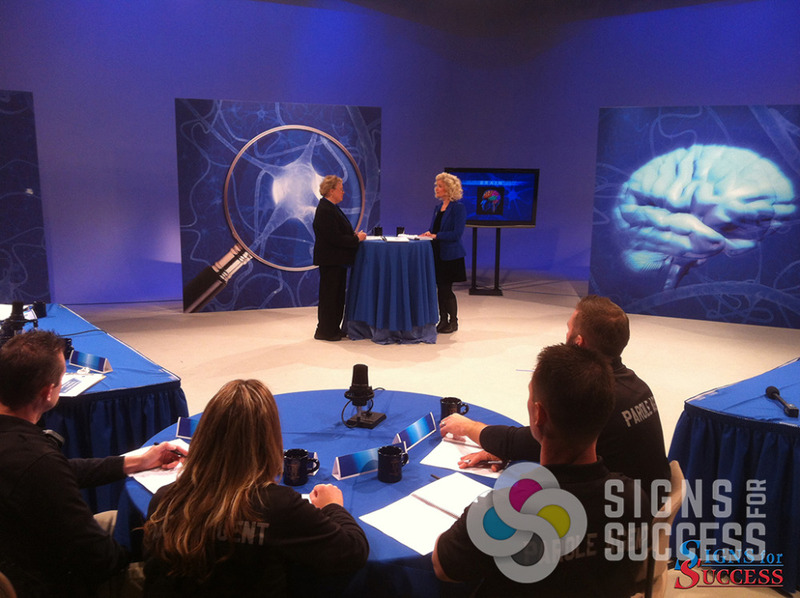 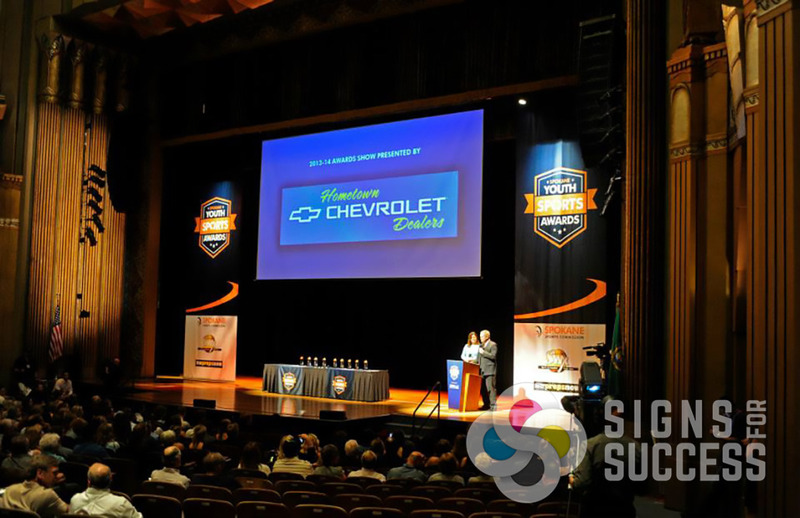 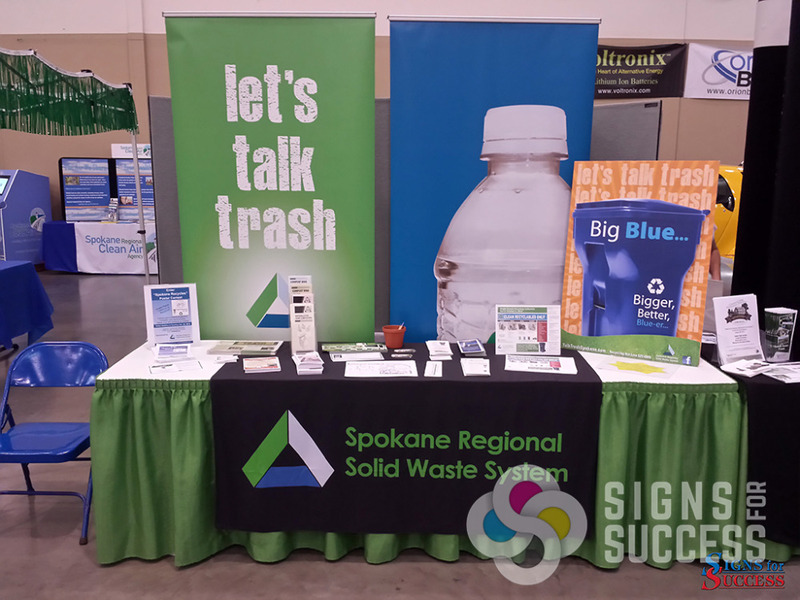 Signs for Success supplies full-size or tabletop trade show displays including pop-up displays, tube displays, and modular trade show displays for conventions, exhibitions, trade shows, and other promotional events. 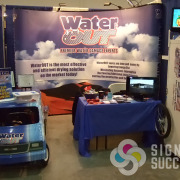 We even have a couple in stock to rent. 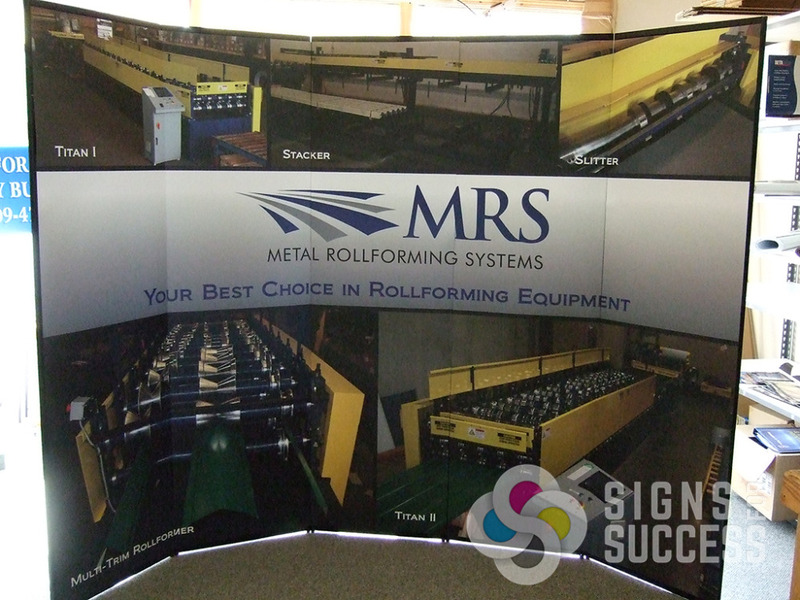 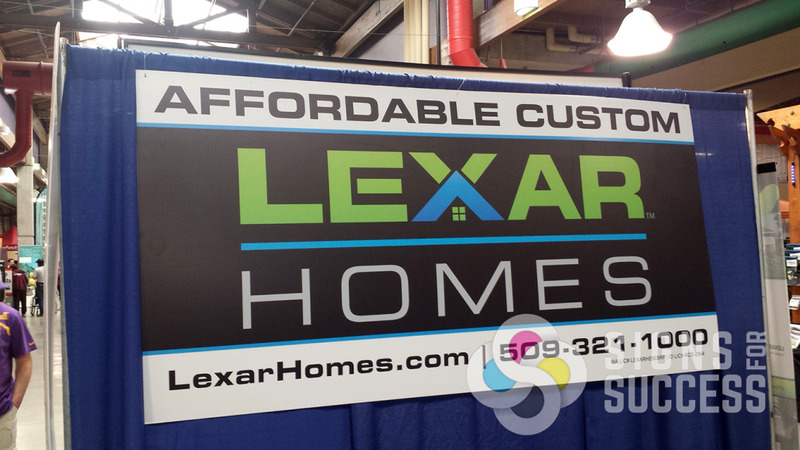 Popup or Background Displays are lightweight, portable and easy to set up. 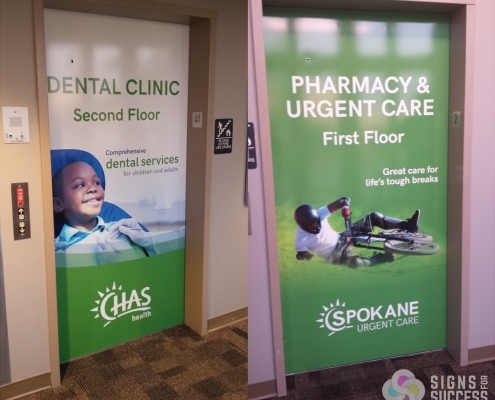 We can digitally print your graphics to almost any surface or material. 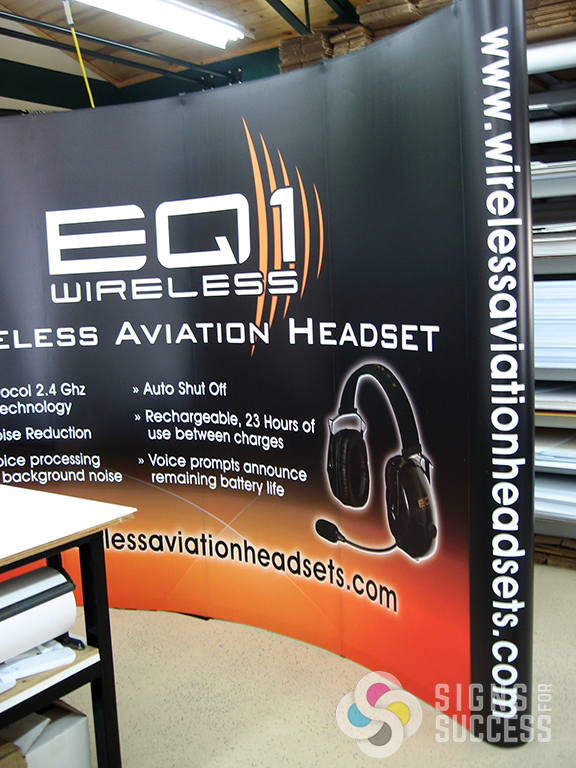 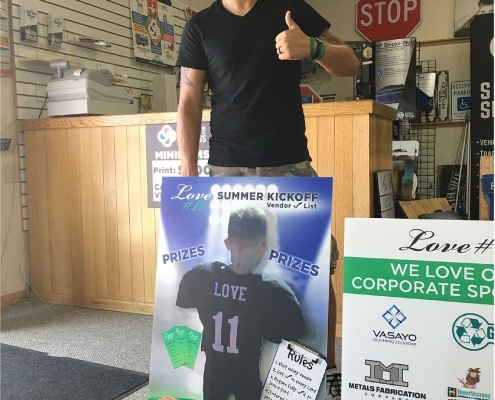 Many popup displays are now printed on stretch fabric, and are very easy to put up and take down, even for only one person (but it’s always quicker with two). 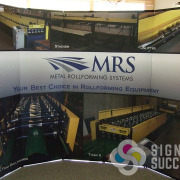 The modular folding frame packs into a portable rolling case and sets up by expanding the frame into a full presentation wall. 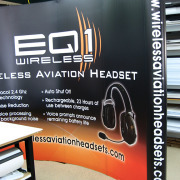 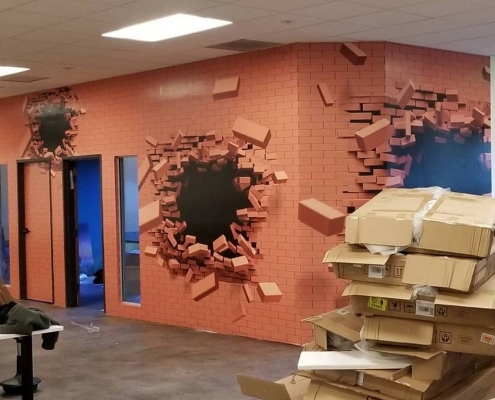 Detachable graphics are another good option since they can be switched out and stored easily. 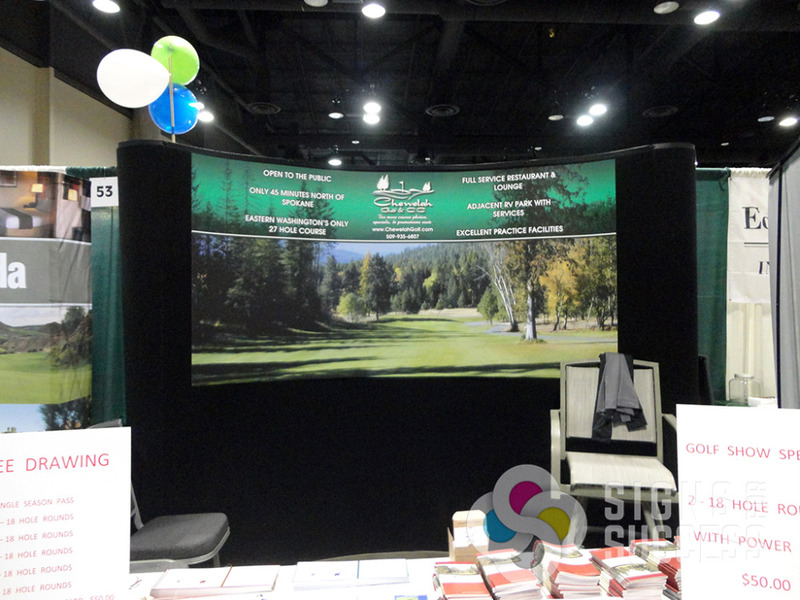 Detachable graphics are panels that attach to Velcro-receptive displays with a strip of Velcro on the top and bottom of each panel. 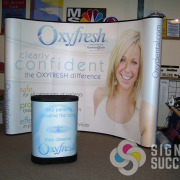 They are simple to customize and update for different events. 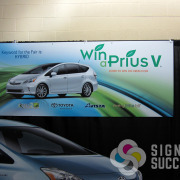 Check out our popular paparazzi photo walls for events. 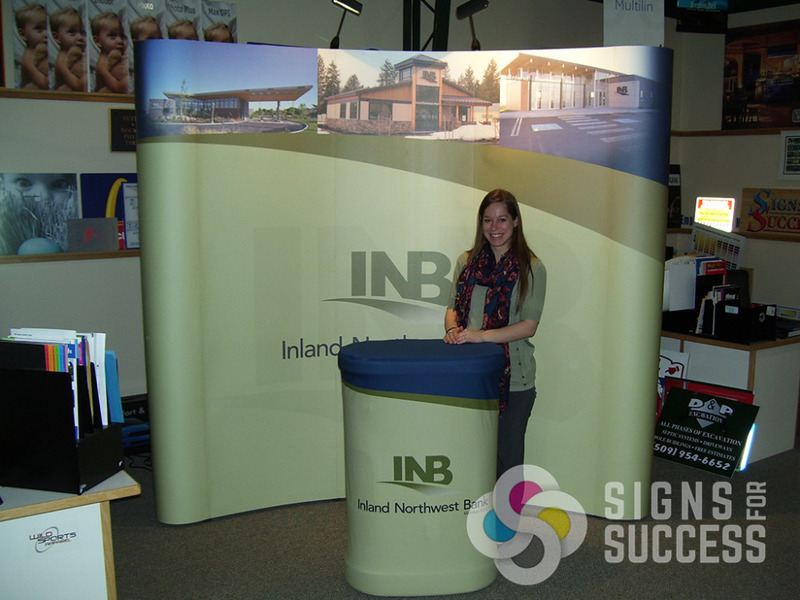 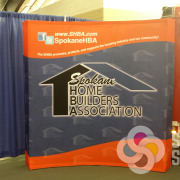 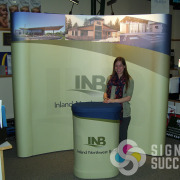 Trade show accessories such as Custom Table Throws can really tie together a tradeshow display. 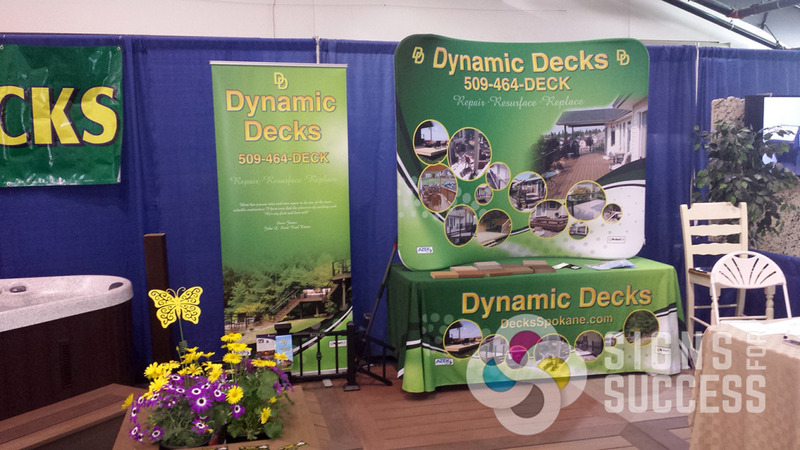 custom table covers, tablecloths, and table runners give your tradeshow display a cohesive and professional look. 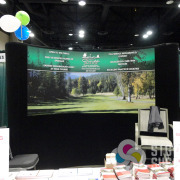 A full color table throw will compliment your display without distraction. 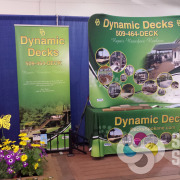 They’re attractive and cost effective, and they can be used over and over. 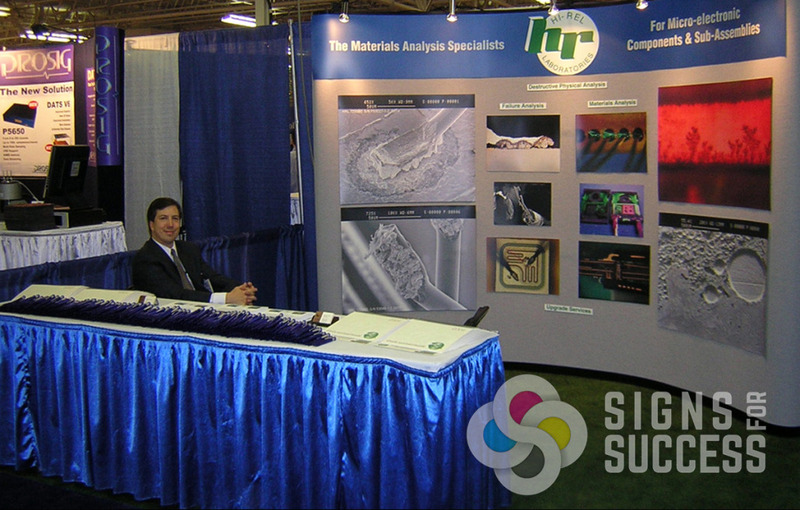 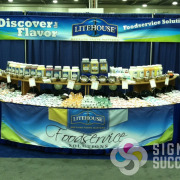 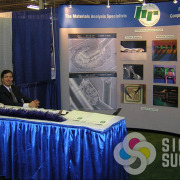 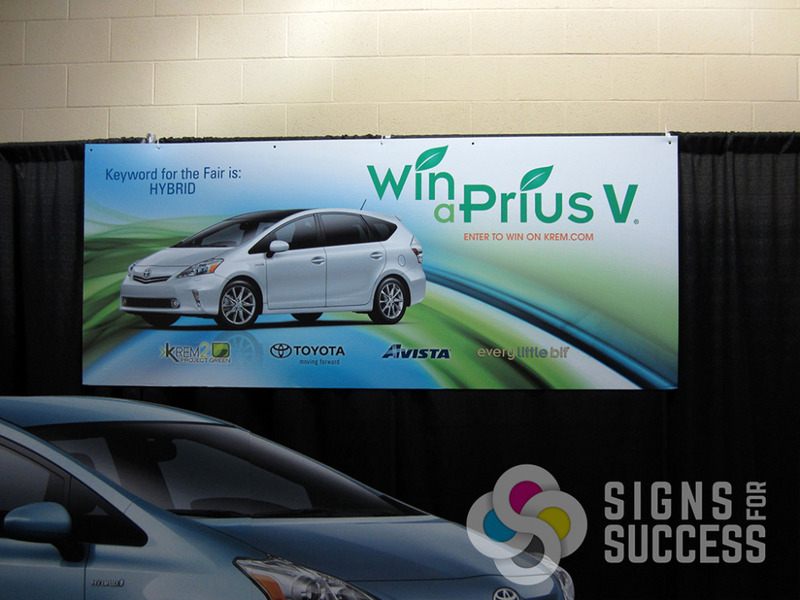 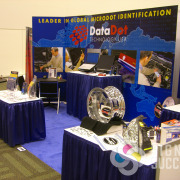 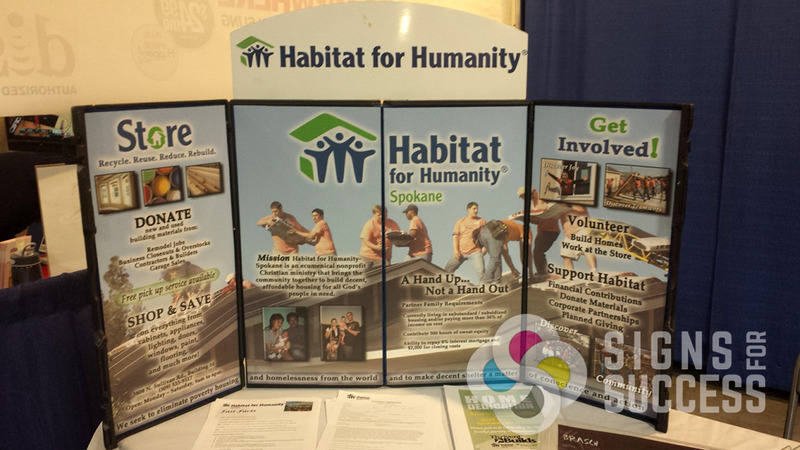 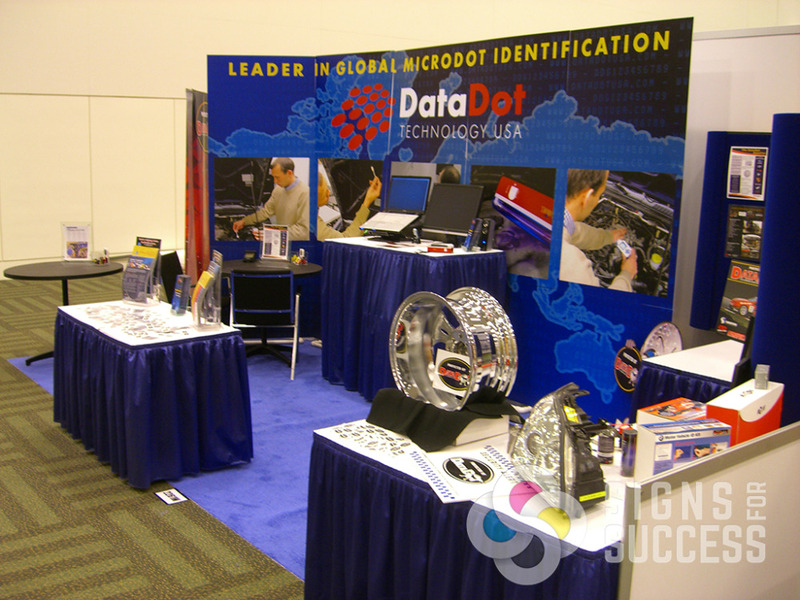 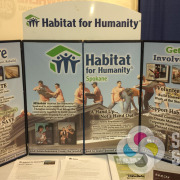 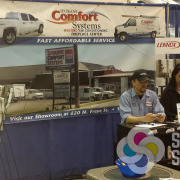 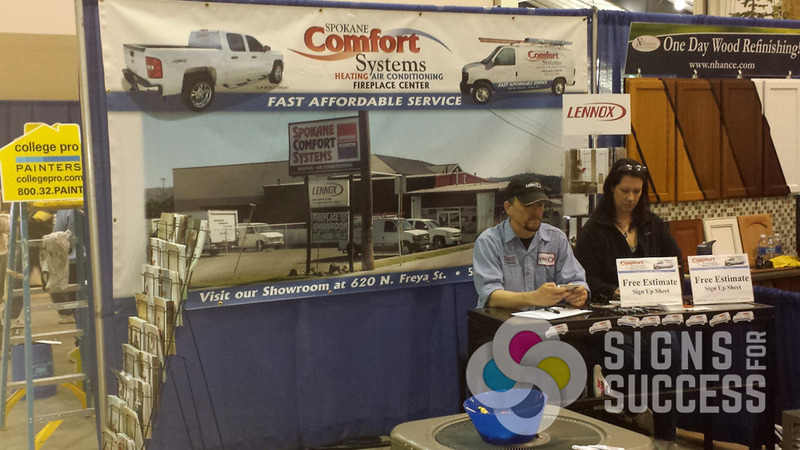 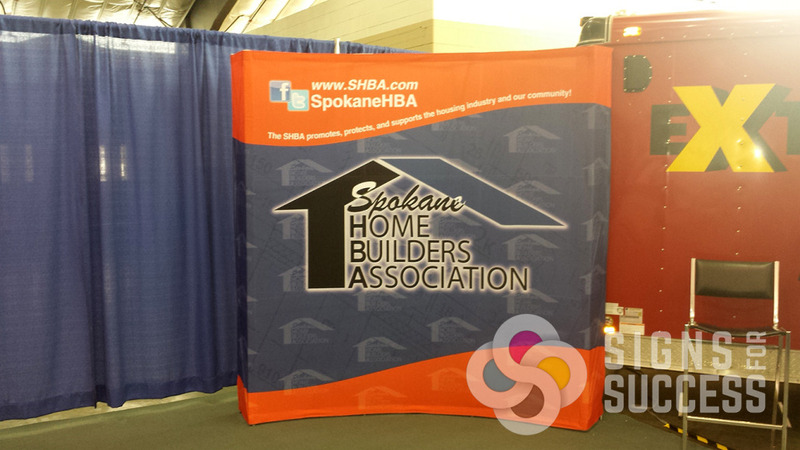 Banner Stands and Custom Floor Graphics are also great additions to any tradeshow display. 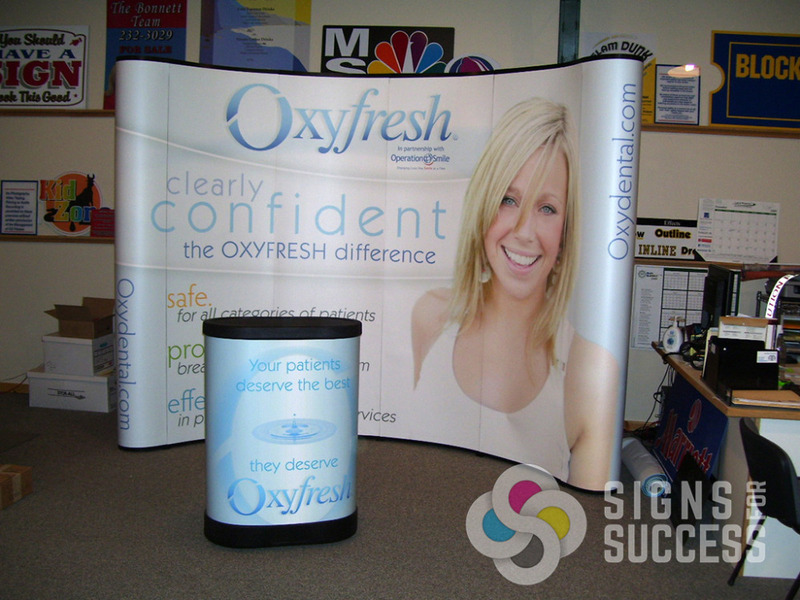 They expand your viewable area, attract attention, and serve as conversation starters. 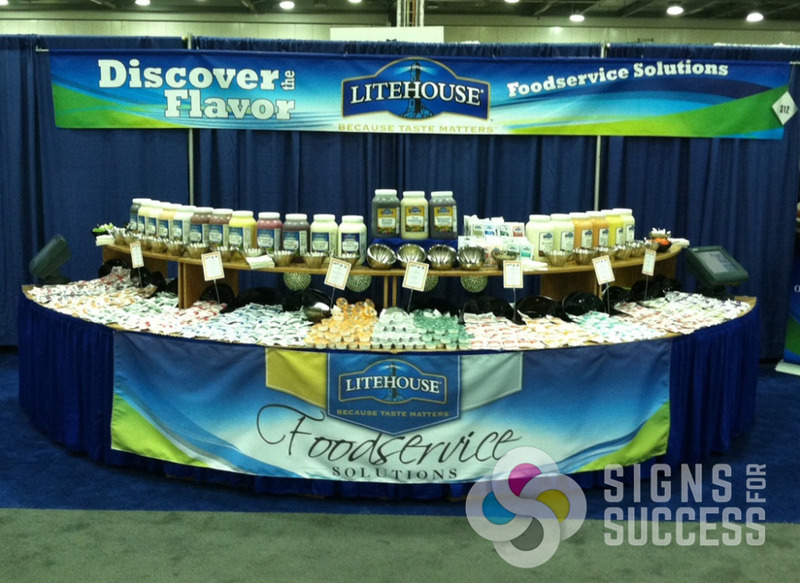 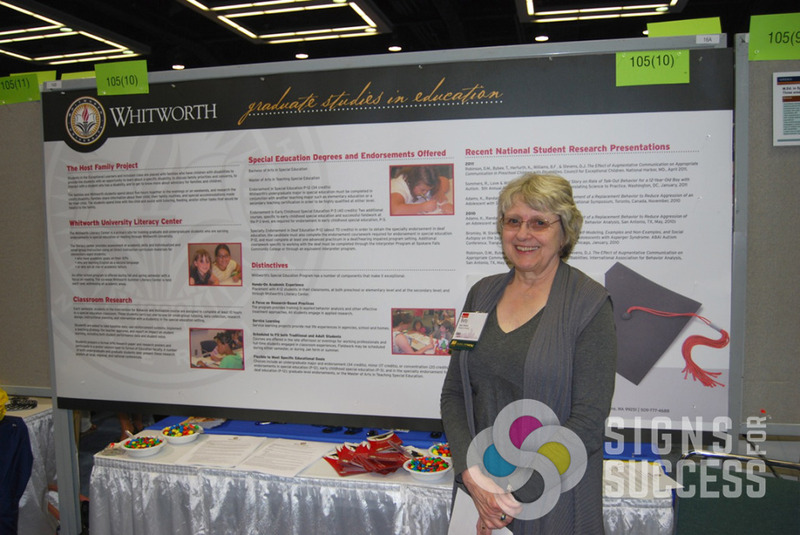 When it comes to designing your tradeshow display, less is oftentimes more. 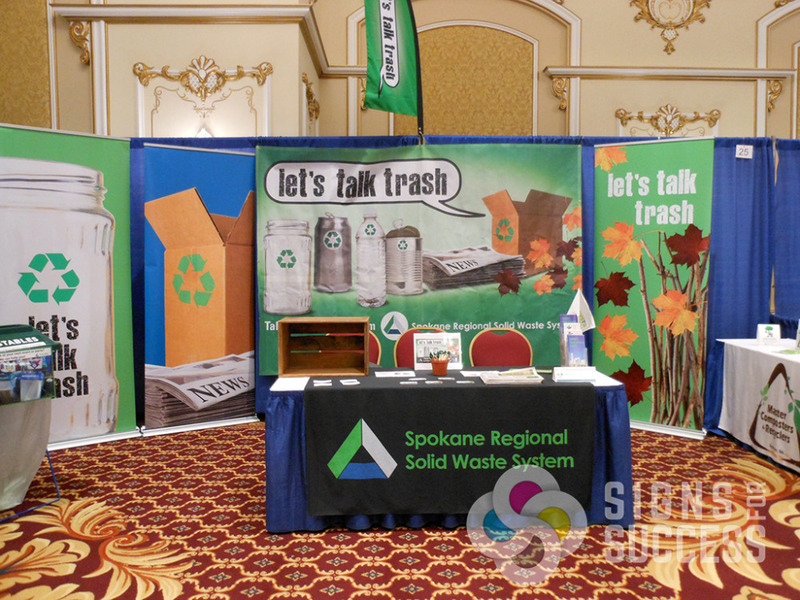 Tradeshow attendees will walk past hundreds of displays, so graphics should make an immediate impact, and text should be brief and clear. 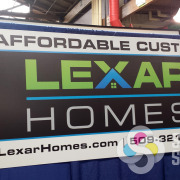 Our Design Team can help you with design and layout of high resolution graphics as well as logo design. 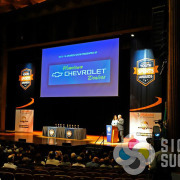 See artwork submission guidelines.